OK, I think I got it, a bouquet of Tulips? check. Yellow? check. "Thinking of you" sentiment? check. This even has popped out butterfies on the cup/vase. That is so fun, Barry! Great work. 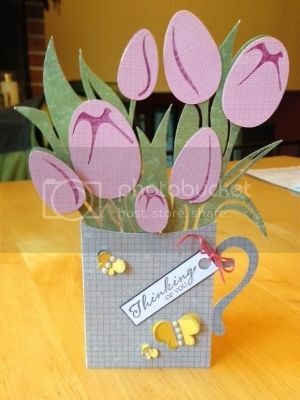 Tulips in a mug? You are so creative, Barry. Love this! Terrie, I hoped to get this challenge done but wasn't able to. I love tulips....they are one of my favorite flowers. So many pretty cards were made for this challenge. I enjoyed looking at them all. I have to say, Barry's tulips in a mug was so stinkin' creative! Great job everyone!